Weddings, birthdays, graduations, any day ending with a “y”… it’s always the right time for a delicious cake. Whether you’re celebrating with family, colleagues or just enjoying a sweet treat alone, you want that dream cake. You know the one. Moist, fluffy, sweet… and with Pinga, you can get that luscious cake delivered right to your hands in just 30 minutes. Whether there’s a surprise birthday in the office or you want to treat a loved one on a special day, happiness is just a few taps away. The process couldn’t be simpler. You just have to download our app and describe your dream cake in a request to our Pinga Partners. A local partner will help you right away and clarify your request. You pay securely through the app and try to distract yourself for 30 short minutes until your cake arrives! The simple and swift process makes your cake all the sweeter! At Pinga, we make sure that every delivery goes perfectly. We get the right product at the right time, and every Pinga Partner delivers with a smile! Our service exists to make your life simpler and more convenient. Our service extends beyond cakes, too. You can get anything delivered to you whenever you need it. Whether it’s a bottle opener, a bottle of wine or some nibbles, you can always rely on your Pinga Partner to deliver what you need, when you need it. There is no minimum spend, either, meaning that you won’t have to worry about beefing up your order with things that you don’t need. Simply order exactly what you need at that very moment. Getting started with Pinga is simple and we can’t wait to have you on board. To help you get started today, here’s a closer look at our service and how everything works. Pinga is not affiliated with any supermarket, retailer or an official partner. We operate independently and offer quick delivery service from any local shop based on your order. 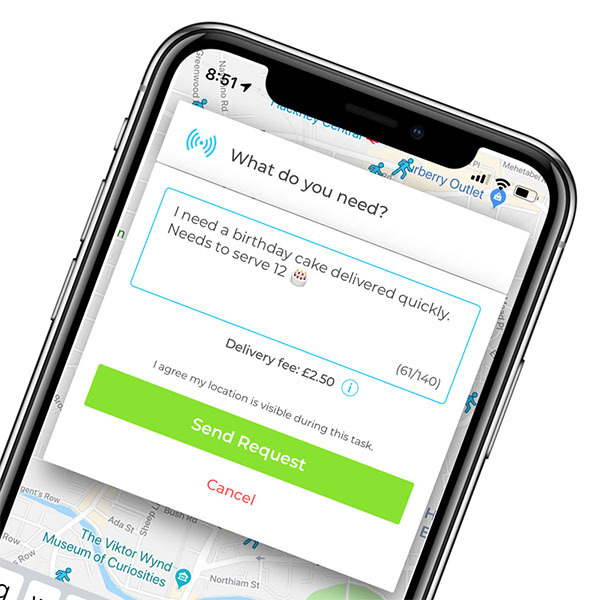 Our team of Pinga Partners will deliver any cake to your door. Download the app, request your order and get it delivered in minutes. Needed a couple of birthday cakes for an office birthday. Perfect cake for special occasion, and delivered in less than an hour! Needed some cake delivered to a friend who needed a few more for a party. Very helpful!